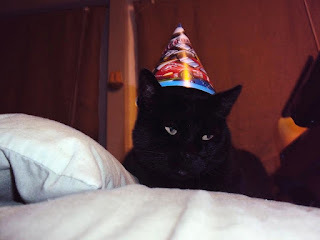 Cat Noir CC is a humorous blog dedicated to all cats because they all deserve to be cared for and loved. 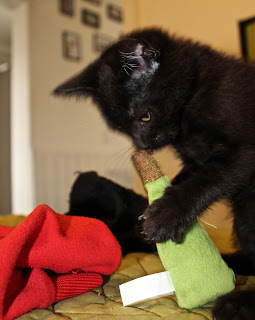 There is a special spot in my heart, and the beating pulse of this blog, for black cats who have a rougher go of it than felines of other colors. Black cats and dogs can languish in a no-kill shelter cage longer, or be euthanized more readily in other shelters, than their colorful counterparts mostly because of the stigma that surrounds them. Black cats have a bad rap because superstition surrounds the color of their fur, which is associated with witchcraft and satanic ritual. This isn’t the Middle Ages. If you would like to revisit that time, might I suggest you start by disconnecting your electricity, sewer and smart phones? I am running a sale on chamber pots if you should need one. Then there is the bad luck associate with black cats. They do not precipitate bad luck anymore than stepping on a crack will break your mother's back. If you still have doubts, ride an albatross with a four-leaf clover glued to your forehead when running errands. 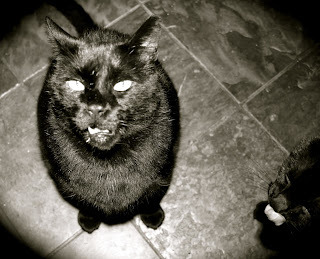 Black cats also suffer from the perception that they are not as photogenic as their counterparts. Yes, it takes a little more skill, a little more light and perhaps a little more patience, but very few cats are eager to have their picture taken resulting in 99 out of a hundred blurred shots of the cat's backside. There have even been a few articles about them not looking good in selfies, newsflash—most of us don’t look good in selfies. Seriously, how many do you take before you actually post one? 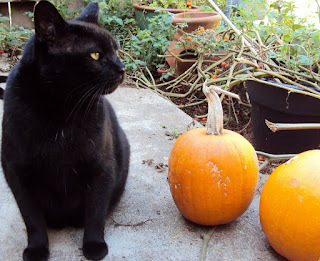 During the month of October, many shelters won't let people adopt black cats to keep them out of the hands of those looking for a Halloween party accessory. Let’s face it, some humans should be carved rather than pumpkins. All sentient beings deserve to be treated with kindness and dignity. I have three black cats. 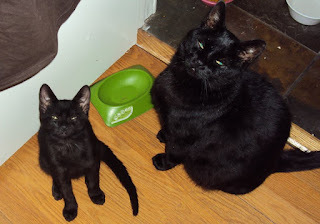 Whiskey who adopted me, Boris who I adopted from a volunteer rescue organization, and Virgil who was a feral kitten but was very ill and was saved by a veterinarian who feeds the colony. When I adopted Boris, his foster mother hugged me because she was so worried that he would be left behind by all the people fawning over the calicos, the torties, the tabbies and the tuxedos. 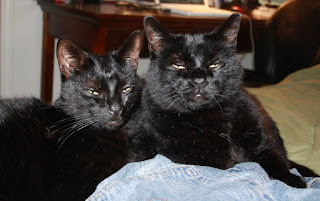 I wouldn’t trade Whiskey, Boris or Virgil for anything in the world, not because they are black, but because they part of my family. Remember, black absorbs all the visible colors of the spectrum, in, this case, what it reflects is up to you. Read the blog and subscribe at CatNoirCC.com. Follow us on Facebook for daily photos of the boys, and on Twitter and Instagram. Jewelry and other things are coming with a portion of profits going to a non-profit benefiting cats. Great to find both this blog and the counterpart Facebook page. Our black beauty, Kit, we adopted from a local no-kill shelter. She spent two years lying in a shadowy corner of that shelter, two long years before we met her and fell in love with her. 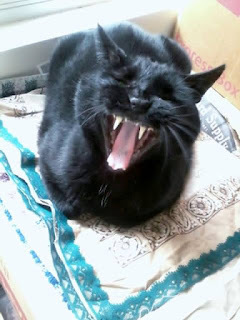 At that time, I discovered how "silly" many people can be, how superstitious about black beauties. I'd never before known about how this superstitious attitude affects adoption rates. I love our Kit. She is this year running to become the first feline, female president (see my Facebook page, search for Anthony V. Toscano, in Morro Bay, CA). Thanks for your work. Thank you Anthony. I am so happy that you brought Kit into your family. It is sad that any animal is in a shelter, but to be ignored because of absurd superstitions is even worse. 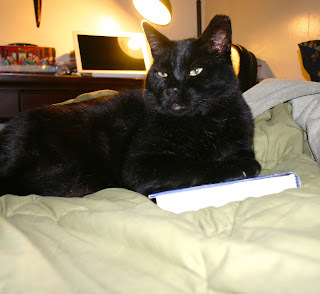 Our first family cat was a black long-haired guy named Frodo who was the best. Now, as an adult I have the two boys and am considering adopting another one.